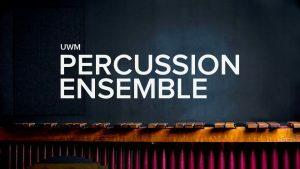 The UWM Percussion Ensemble presents its annual Spring concert featuring a variety of instruments, sounds, and music from different periods. Featuring UWM Undergraduate and Graduate piano majors in performance of solo and collaborative repertoire. Wind Ensemble and Symphony Band concert. This recital will be featuring students from the University of Wisconsin-Milwaukee and alumni performing a flute ensemble repertoire. Chamber repertoire from the students of prof. Rene Izquierdo. An evening recital with one of the foremost guitarists of our generation. UWM Symphony Orchestra under the direction of Jun Kim, will conclude its season performing one of the most popular symphonies by Bruckner, Symphony No. 4 "Romantic". Join us for an evening of beautiful music! Join UWM piano faculty members for a festive day celebrating Mozart’s keyboard genius! The day-long event will focus on an in-depth exploration of Mozart’s piano music. Join the UWM Concert Chorale, Advanced Women's Choir, Men's Choir, Women's Chorus, and Chamber Choir in their final concert of the 2018-2019 school year as they explore choral literature from a variety of styles, locations, and time periods. The final concert performance of 2018-19 by the UWM Youth Wind Ensemble program (UWAY) will feature winner(s) of the Annual UWAY Concerto/Solo Competition and a recognition of students who will soon graduate from high school and from the UWAY program. University Community Orchestra, led by conductor Margery Deutsch, performs works from classical and pops repertoires. The UWM Saxophone Studio presents an evening of solo and chamber music. Featuring the students of Dr. Nicki Roman. The UWM Gospel Choir under the direction of Ken Daniel performs an evening of Gospel music. 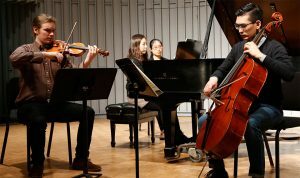 A recital of chamber music groups composed of UWM PSOA students. Join the UWM Jazz Ensemble and Youth Jazz Ensemble (UJAY) for their final concert of the year. 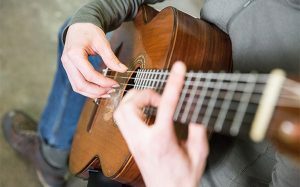 The String Academy’s twenty-ninth annual Scholarship Benefit Concert will feature String Academy violin students, ages 6 to 18, performing repertoire from various eras and styles.